CHESTNUT AVE - *HALF BROKER FEE! * Newly renovated apartment that's beautifully done! Gut rehabbed in 2016. 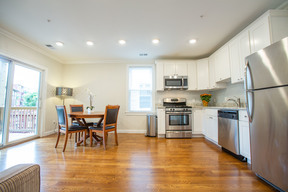 Features renovated kitchen with stainless appliances, two full size (gorgeous and newly renovated) bathrooms recessed lighting, laundry IN UNIT (excellent! ), spacious bedrooms, private deck and CENTRAL AC (fabulous!). Perfect location for local Longwood, Fenway and Notheastern area universities! *graduate students welcome!*. Close to local amenities such as Whole Foods, Blue Nile Cafe, Pikalo, 10 minutes to the bike path and easy access to transit (Orange Line @ Jackson Square MBTA and various bus routes.) Do NOT pass this up! Call today to schedule an appointment. FIRST, SECURITY, *HALF BROKER FEE*, LEASE UNTIL 8/31 (WITH OPTION TO RENEW) REQUIRED. 06. Laundry: IN UNIT! Newer machines! 08. 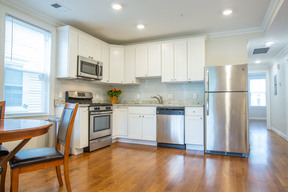 Kitchen: GUT RENOVATED and gorgeous! 15. Terms: First, Security, *1/2 BROKER FEE*, Lease until 8/31 (with option to renew) required.